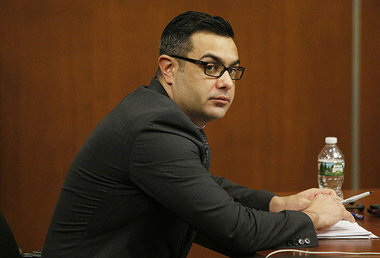 A wannabe mobster who admitted to killing a man with a pickaxe testified Tuesday that he murdered the Edison man in 2011 to impress his friend, who he believed was connected to the Mafia. Daniel Medaglia, 32, has already pleaded guilty in the death of Kelvin Dumo, whose body was found at a Sayreville site on Jernee Mill Road, but authorities have accused Michael Doce was the "mastermind" behind the Edison man's killing. Medaglia is the state's key witness in the case against Doce, who faces charges of murder and conspiracy. Medaglia, of Edison, man struck a deal with prosecutors for 30 years in prison in exchange for his testimony against his former friend, Doce. On Tuesday, Medaglia took the stand where prosecutors expect him to testify before a jury of 10 women and six men that Doce had ordered Dumo killed. His testimony is expected to last at least three days with the first day's proceedings stopped by numerous objections from the defense and side bar discussions. Medaglia had yearned to become connected to organized crime and when he met Doce in 2009, he believed he had found his in to the criminal underworld in New Jersey, according to his testimony. "[Doce] said he was going to introduce me to members of the family," Medaglia said before a jury Middlesex County Superior Court. "Money. Cars. It was an attractive lifestyle." Medaglia testified he had "no reason not to believe" Doce when he claimed his "Uncle Paulie" ran Genovese crime family in New Jersey, that he was an underboss or he'd been kidnapped by a rival crime family and held in a storage container in Staten Island. Daniel Medaglia testifies in court Tuesday, May 23, 2017. "It made sense," Medaglia said, noting Doce's construction job and his family's concrete company. Doce told Medaglia of his ties to the organized crime about six months into their friendship in 2009, he said from the stand in Superior Court Judge Dennis Nieves' courtroom. Doce even claimed to have shortened his last name from Docessa to hide from authorities or mobster enemies, according to his testimony. Medaglia testified that Doce forced him to wait around the corner on Inman Avenue in Edison when the two went to buy hundreds of pills from a man who Doce said was high-up in the mafia. "I thought it was all real," Medaglia said as Assistant Prosecutor Vincent Vitale questioned him. Doce had also introduced Medaglia to a handful of friends who claimed to be hit-men for the mob and loan sharks, Medaglia said in his testimony. Medaglia had wanted to set up his own loan sharking operation and Doce said he could help, Medaglia testified. Doce's defense attorney Eric Breslin said in his opening statements that his client was innocent in the killing and was simply playing around with Medaglia as he texted wild stories of organized crime, often lifted from popular movies and shows. Doce used the stories as a way to rebuff Medaglia when he wouldn't leave him alone, Breslin said. Medaglia, who said he was "best friends" with Dumo at J.P Stevens High School in Edison, had introduced Doce and Dumo in 2010, according to his testimony. The three had sold pills back and forth, according to Medaglia, who testified that he was taking close to 30 oxycodone and Xanax pills a day while dealing. Medaglia and Dumo grew apart shortly after an incident at a 7-Eleven where Dumo was arrested, he testified. Doce had offered to help Dumo with the charges for $500, claiming he had "deep" connections in the prosecutor's office, according to Medaglia. Dumo declined and told Medaglia he didn't believe Doce had any ties to the mob. Medaglia said he described Doce as the "real deal member of the mafia" and tried to convince Dumo to pay for Doce's help. The five-week trial is expected to continue Wednesday morning with Medaglia on the stand again.